Fiction – paperback; Gollancz; 224 pages; 2000. 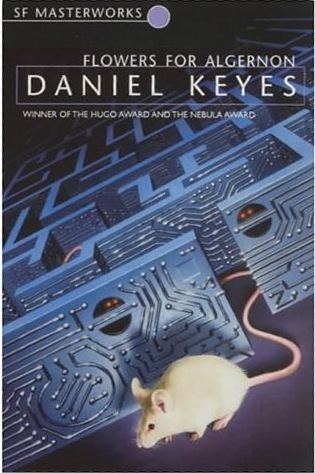 Daniel Key’s Flowers for Algernon is a very special science fiction novel that reveals much about the human condition and the ways in which we relate to others. It touches on many issues including the way we treat the mentally handicapped, the ethics of scientific experimentation on animals (and humans), our desire to be “normal”, the differences between IQ and EQ, and the ways in which our childhood experiences impact on our adult lives. It was initially published as a novella in 1959 for which it won the best short fiction prize at the 1960 Hugo Awards. Keyes then expanded it into a full-length novel but it was rejected by five publishers. When it was finally printed by Harcourt in 1966 it won the Nebula Award for Best Fiction that same year. I read the short story version of Flowers for Algernon when I was at secondary school, but this was the first time I’d read the fully fledged novel. It tells the story of Charlie Gordon who has an IQ of just 68. He is 32 years old, no longer has any contact with his family and supports himself by working in a bakery, where he sweeps the floors and runs errands. Researchers at the local university select him to take part in a scientific experiment designed to boost his intelligence which has already proved successful on a mouse called Algernon. The story is told in diary form, or “progress reports”, from Charlie’s perspective. Initially his writing abilities are rather dubious, with grammatical errors and phonetic spellings throughout, but as his intelligence increases so does his ability to express himself. Within quite a short period of time, Charlie becomes much cleverer than his colleagues at the bakery, who begin to shun him because they don’t understand his sudden transformation from simpleton to genius. But his emotional development is still stunted, which causes problems with how he relates to others, especially women. Things begin to unravel when he attends the scientific conference, where the success of the experiment is to be announced to the public for the first time. We were the main attraction of the evening, and when we were settled, the chairman began his introduction. I half expected him to boom out: Laideezzz and gentulmennnnnn. Step right this way and see the side show! An act never before seen in the scientific world! A mouse and a moron turned into geniuses before your very eyes! From then on, Charlie goes on an amazing psychological adventure as he comes to terms with his past (including the mother who dumped him in a home when he was a young boy because he wasn’t “normal”) and develops feelings for the teacher who once took pity on him. It’s an amazing journey, full of ups and downs. It’s also hugely emotional, because as Charlie’s self-awareness and moral conscience grows, so does his frustration and his pain. Was the experiment really worth it? Was he really better off being exceptionally intelligent? Or was he happier being a simpleton who at least knew his role in the world? I won’t spoil the ending, but it’s a thought-provoking one. I’m so glad I read this truly wonderful book, because it’s a story that will stay with me for a long time. Despite its age it seems remarkably contemporary. If you’ve never read any science fiction before, this may well be the place to start. I remember reading this one at school as well and I’m keen to revisit it now that you’ve reminded me of how thought-provoking it is. I loved this book. I thought it was so thought-provoking and I seriously loved Charlie. I agree with you about how contemporary the book remains even though it was published quite awhile back. Great review! I desperately loved this book, and it raises so many big questions. I read it last year, but I may suggest it to my book group as I think we, like your group, would get a lot out of it. Wonderful review of a wonderful book. I am would have to agree with the five stars, though at the time I gave it 4.% (in my head) but the book and its themes have stuck with me since and I have been thinking about it alot. I may have to get my Gran to read it whilst she is here, though currently she cant put Love & Summer down! It’s a great book for a book group because there’s so many issues to discuss. I assume you mean four STARS and not four PERCENT? Your comment reminds me that I ought to read Love & Summer some time soon. I have a copy in the TBR. 5 stars?! Wow! I’m so pleased to see that you enjoyed my choice. I think that I will remember this book for a very long time, and am considering giving it 5 stars too. Great review. It’s a great book, Jackie. Not just the issues it raises, but as a piece of writing it’s near perfect: plot, character, narrative, pacing, style, etc all the stuff I analyse when I read a book is here. We read this at school and then I re-read it as an adult. It is an incredible book. I might need to re-read it again. I think it’s one of those books that would warrant a re-read — certainly lots to mull over and chew on.